Create themed displays with the most popular ARGUS Large Posters in this value-priced combo pack. Lively visuals and popular themes energize learning, spark discussions, build character and encourage new ways of looking at life. The results are motivated, successful students who reflect the positive attitudes and behaviors portrayed in these creative themes. Each poster measures 13-3/8" x 19". 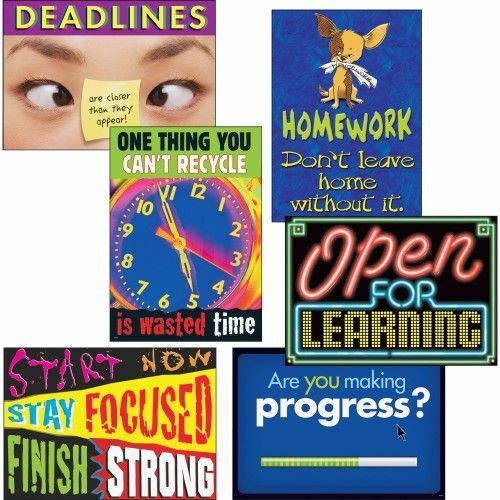 Motivation posters include Homework: Don't leave home without it; One thing you can't recycle is wasted time; Start Now, Stay Focused, Finish Strong; Deadlines are closer than they appear; Are you making progress? ; and Open for Learning.